“The Deadliest Trap in the World!” I first discovered this curious oddity after browsing through Michael Weldon’s essential 1983 film guide, The Psychotronic Encyclopedia of Film, in which the author states that The Maze has “the most unusual ending you’ll ever witness.” Needless to say, my curiosity was piqued! 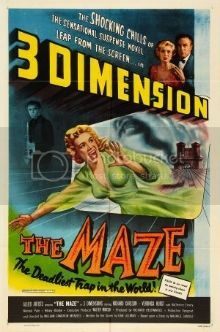 A low-budget, atmospheric horror film directed by William Cameron Menzies (Invaders from Mars) and originally shot in 3D, The Maze stars Richard Carlson (Creature from the Black Lagoon) as “Gerald MacTeam,” a Scotsman who moves to a creepy castle in the Scottish highlands after learning of his uncle's death (he's next in line to inherit the baronet position). Gerald’s jilted ex-fiancée “Kitty Murray” (Veronica Hurst) travels with her “Aunt Edith” (Katherine Emery, who narrates the action occasionally directly to the camera) to the castle and they discover that Gerald has aged significantly and appears to be in the midst of a mental breakdown. When he can’t convince them to leave immediately, Gerald insists on locking the ladies in their rooms at night – assisted by his weird servants “William” (Michael Pate) and “Robert” (Stanley Fraser). Kitty starts witnessing strange goings-on in the castle’s adjacent hedge maze (did Stanley Kubrick watch this flick before filming The Shining?). Oh yeah, the ending is indeed amazing – I won’t ruin it for you but it’s simultaneously fascinating and absolutely ridiculous – don’t miss it! Useless Trivia: The Maze was based on a 1945 novel of the same name by Maurice Sandoz that featured illustrations by Salvador Dali.